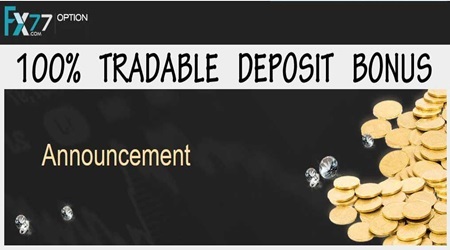 FX77 offer 100% Deposit bonus for all new clients. Bonus could be received after minimum deposit of $1000. If you deposit more, you will receive more bonus! FX77 is binary options broker established in 2013 in New Zealand. The broker is regulated by FSP, as with FX77 clients could trade more than 137 trading assets. The trade types are Higher/Lower, Turbo, Bound and One touch. The minimum deposit amount is $100, as the minimum trade bid is $5. The minimum trade payout is 60%, as the maximum is up to 85%. Open new account in FX77 and verify your account details. After verification process you should choose your account type, this depends on how much money you will deposit. You should deposit minimum $1000 to receive 100% deposit bonus. After deposit you need to request your bonus. This Promotion is valid for all new clients only and only valid for verified accounts. If traders want to withdraw all their profits, they must trade 10 times the sum of deposit and bonus. If you want to withdraw the bonus you must make turnover, as you should follow the picture above.